OS X Yosemite is here! Apple's newest operating system features a new look, with a flat interface inspired by iOS 7 and 8, and dozens of new features designed to make iOS users want to buy Macs. But what about security? How can you ensure that your Mac is as secure as possible? 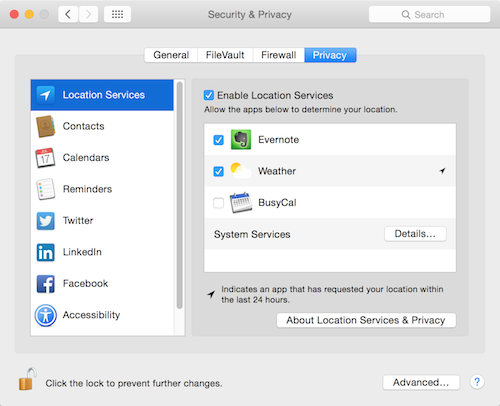 Here's an overview of Yosemite's security and privacy features. 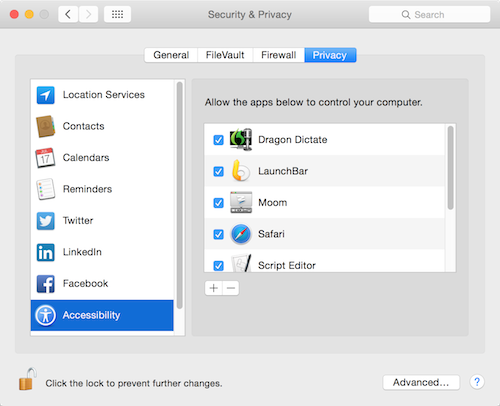 You can adjust all of your Mac's security and privacy settings in a single preference pane. 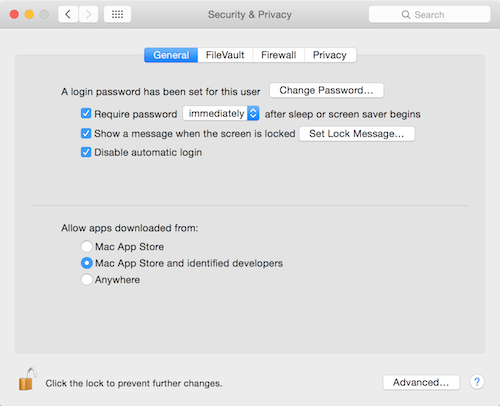 Open System Preferences — from the Dock or the Apple menu — and click on Security & Privacy. The General pane gives you access to basic settings. If you're not an administrator on your Mac, you won't be able to make changes that affect the entire computer; only those that apply to your user account. If you are an administrator — or the only person using your Mac — then you'll be able to access all the settings; click the padlock icon, then enter your password. In the bottom of this pane, it's a good idea to limit which apps can launch without special approval. You may want to limit this to Mac App Store; this would be a good idea for, say, a Mac that your kids are using. But the intermediate setting — Mac App Store and identified developers — is probably best for most users. When you try to launch an app that's doesn't meet these conditions, you'll get an alert, and you can still manually approve it, but this setting prevents rogue apps from running on your Mac without you being aware. 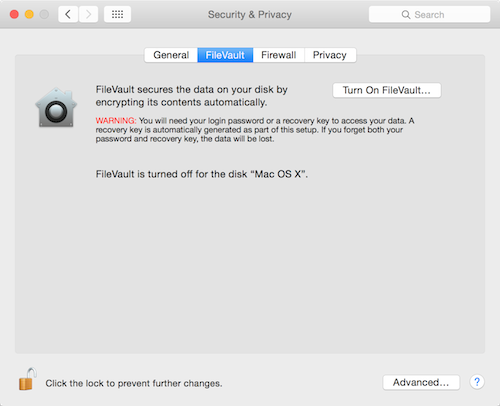 Apple's FileVault full-disk encryption has been around for a while. If you have a laptop and travel with it, it's a good idea to turn this on. You can do this on the FileVault pane. Just check Turn on FileVault and follow the instructions. Don't do this when you're on the way out the door on a trip to visit a client; it will take a while, depending on the size of your startup volume, as all the data has to be encrypted. You can choose to allow your iCloud account to unlock your disk, in case you've lost or forgotten your password, or you can create a special recovery key that you'll need for such a situation. It's probably best to use the iCloud account option, as you'll need to remember the recovery key, or have access to it. 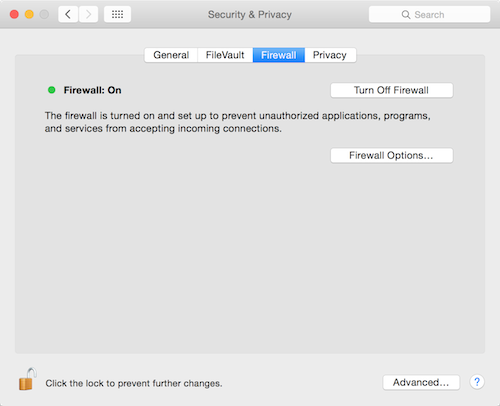 OS X Yosemite provides a basic application firewall, which allows you to accept or deny incoming connections to your Mac by application. If you turn this on, you'll be alerted any time a new app wants to send or receive data. Click Firewall Options to see which apps have sent or received data, and which you've allowed or blocked. You can manually change any of these. It's good to use this firewall, as it provides a basic level of protection, but it's not foolproof — it does not provide outbound firewall protection — and you may want to use a more robust firewall to truly lock down your Mac. The Privacy tab offers a number of options that you can set to keep your information secure. In the sidebar, you'll see a list of items, many of them simple: Contacts, Calendars, Reminders, Twitter, Linkedin and Facebook all show which apps have requested to access this information. You'll see alerts when apps make such requests, but you can look here from time to time to check, and revoke access if you wish. Location Services is similar. You'll see a list of apps that have been accessing your location, and if you click Details next to System Services, you'll be able to choose whether or not to allow Spotlight Suggestions to access your location. The Accessibility section needs a bit more attention. 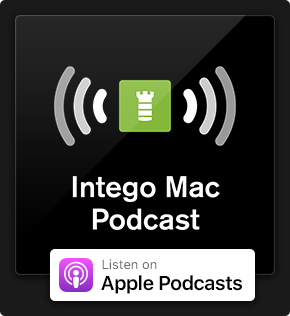 You may have noticed that certain apps, when you launch them, display a dialog telling you that you need to go to these settings to allow them to control your Mac. This may be the case with apps that can access certain files on your Mac, or even applets created with AppleScript. When you see this alert, the app in question will be added to the Accessibility list, and you'll have to check the box next to its name. This is the case for many apps; on my Mac, apps such as Dragon Dictate (a speech recognition program), LaunchBar (an application launcher, and much more), TextExpander (an app that replaces abbreviations I type with longer text snippets) and Script Editor (used for creating and running AppleScripts) have all asked permission to control my Mac. 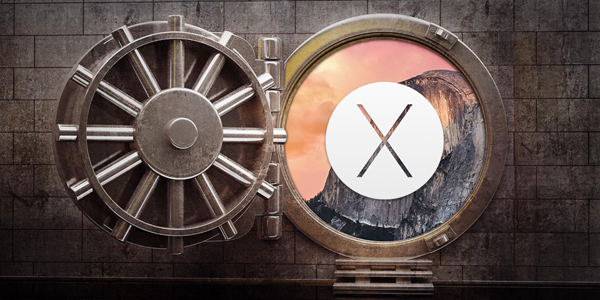 With all these security settings, you can help make your Mac extra secure while running Yosemite. Take a few minutes to check them out, and turn on the settings that work for you. Want to add more security and privacy to your Mac? 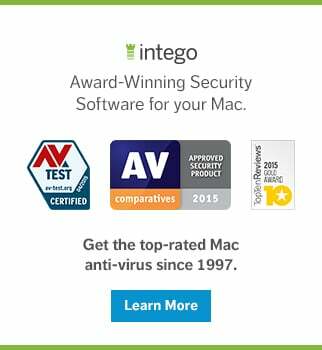 Protect your Mac with multiple layers of security and increase privacy with our two-way firewall and Mac anti-virus for OS X Yosemite — get Mac Internet Security X8 today! This entry was posted in Apple, Recommended, Security & Privacy and tagged Accessibility, Apple, encryption, FileVault, Firewall, Location Services, Mac, OS X Yosemite, Overview, privacy, security, settings, Spotlight Suggestions, System Preferences, Yosemite. Bookmark the permalink. I have a problem with Yosemite 10.10.2: When I try to “Click the lock to make changes.” in Security & Privacy, the lock immediately snaps shut–disallowing me to edit anything in that window. I’ve never heard of that happening. Are you using an admin account? Have you restarted since you installed the update? Yes to both questions. I am stumped. I have to say, I am too. I shudder to have to say this, but you might have to reinstall OS X. Do you have a Mac under guarantee so you can call Apple? facing the same issue, I could access it until last boot up. Using my admin account. but gets rejected only in the “security & privacy” preference. This happens because you do not have a password set up. (Or the password is just hitting enter). Just use a new password and it should work. Im having trouble remembering my Administrator Username. I have a second administrator account and know its Username and password, and I have also verified that both passwords for each account are the same… but I still can’t seem to know what my username is for account #1. How do I get around this? Likewise! I’m having the same problems! My friend is using an empty string password. By setting security to default, does he have to worry about someone hacking his machine remotely? Definitely. Also, a blank password can cause issues with OS X in general. It is not at all a good idea. Hi there! I have a problem with Yosemite 10.10.4: in Security & Privacy I can’t find Disable automatic log in option, why this? Hi i would like to remove Facebook and LinkedIn under the privacy tab. i keep get notifications etc and its annoying. anyone can help?